A stunning sterling silver pendant inlaid with Ammonite & Citrine. Stone(s): Ammonite & Citrine. Stamp: 925. A stunning pair of sterling silver earrings inlaid with Fossil Ammonite & Smoky Quartz. Stone(s): Fossil Ammonite & Smoky Quartz. Sterling Silver tarnishes on prolonged exposure to air and water. Do not use abrasive cleaners or liquid cleaners. H A VE A N IC E D A Y - - - . Sincerely. A stunning pair of sterling silver earrings.inlaid with Fossil Ammonite. Stone(s): Ammonite. Lock Type: Hook. Material: Sterling Silver (92.5% silver content). Category: Earrings. 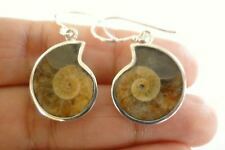 A stunning sterling silver earrings.inlaid with Fossil Ammonite. Stone: Ammonite. Stamp: 925. Material: Sterling Silver. A sterling silver pendant inlaid with Ammonite, Peridot & Citrine. Stone: Ammonite, Peridot & Citrine. Stamped: 925. Category: Pendant. A classic sterling silver pendant inlaid with a Fossil Ammonite. AMMONITE is the preserved mother-of-pearl of this extinct marine creature, which has undergone unexplained natural transformation & obtained light refracting properties. A stunning sterling silver bracelet inlaid with Ammonite & Mabe Pearl. Stone: Ammonite & Mabe Pearl. Lock Type: Lobster Clasp. Sterling Silver tarnishes on prolonged exposure to air and water. Do not use abrasive cleaners or liquid cleaners. A stunning sterling silver pendant inlaid with a Fossil Ammonite & Copper infused Turquoise. Stone(s): Fossil Ammonite & Turquoise. Stamp: 925. Category: Pendant. 103.27 CT. AMMONITE FOSSIL,PEARL,L. ARIMAR,SKY BLUE TOPAZ 925 SILVER PENDANT (HANDMADE). Turquoise or Zircon. FACE PENDANT 83.0 X 30.0 MM. Topaz or Citrine. Opal or Tourmaline. Pearl, Moonstone or Alexandrite. MAIN STONE : Ammonite Fossil. MATERIAL : Gemstone. Elegant Jewellery. MAIN STONE SHAPE : As Seen In Picture. MAIN STONE COLOR : As Seen In Picture. MAIN STONE CREATION : Natural. RING SIZE : 8. Q : Is the stone Natural or Lab - Created ?. A stunning sterling silver pendant inlaid with Ammonite & Garnet. Stone: Ammonite & Garnet. Stamp: 925. Material: Sterling Silver (92.5% silver content). A stunning sterling silver pendant inlaid with a Ammonite, Citrine & Smoky Quartz. Stone(s): Ammonite, Citrine & Smoky Quartz. Stamp: 925. Category: Pendant. Gemstone Type: Ammonite,white mabe pearl(12mm). Main Stone Ammonite. Earring Material: 925 sterling silver. Hook Material: 925 sterling silver. Fastening 925 sterling silver. Main Color Brown. Earring Weight: ~11 gram/ea. Gemstone Type: Pyritized Ammonite. Pendant Material: 925 sterling silver. Pendant Size: 55x32mm(2 1/8x1 1/4") incl. Pendant Weight: ~ 20grams. Rest of world: N/A N/A. Canada: N/A N/A. A stunning sterling silver ring.inlaid with a Fossil Ammonite. Stone: Ammonite. Material: Sterling Silver (92.5% silver content). Stamp: 925. A1438 AMMONITE FOSSIL 925 STERLING SILVER PENDANT 1.6"
A stunning sterling silver pendant inlaid with a Fossil Ammonite. Stone(s): Fossil Ammonite. Stamp: 925. This stunning jewel piece was handcrafted by one of our talented artisans. It is set in precious solid sterling silver, hand polished to a brilliant luster. Our pieces are one-of-a-kind, so what you see in the photo is what you'll receive. A stunning sterling silver pendant inlaid with Fossil Ammonite & Citrine. Stone: Ammonite & Citrine. Stamp: 925 (inside bail). Material: Sterling Silver (92.5% silver content). Ammonite Fossil 925 sterling silver Handmade Jewelry Pendant 1.77"
Main Stone : Ammonite Fossil. All our jewelry is 100% natural conflict free. Occasion : Special Occasion. Magnetite In Ammonite 925 Sterling Silver Pendant 2.29"
A stunning sterling silver pendant inlaid with a Ammonite, Ammolite & Smoky Quartz. Stone(s): Ammonite, Ammolite & Smoky Quartz. Sterling Silver tarnishes on prolonged exposure to air and water. Do not use abrasive cleaners or liquid cleaners.